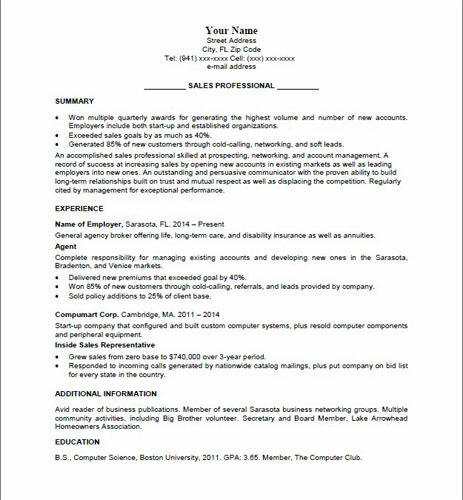 Since most Sarasotans want to remain in our community despite its limited job market, I’ll devote great care in writing an impactful, professional resume for you. The document will showcase your capability and assure the best presentation possible. You’ll gain a leg up on your competition and land the interviews you’re seeking. There are potentially 15 different parts of your background that can be discussed, each in a separate section of your resume. For the vast majority of my clients, however, the summary, experience, and education sections usually suffice. These are regarded as the primary sections. The others are considered to be secondary. Here’s a complete list of the sections. I’ll go over each one with you to ensure that we account for everything that’s important in your background. As you read over these sections, you might want to refer to this professional resume example. To save space, if necessary, I’ll group the secondary sections into “Additional Information” as it appears in the professional resume example. Although not actually a section, your resume will also feature an important entry—a headline—that will appear right after your contact information. Its purpose is to position you in the eyes of readers so that they’ll immediately understand what your specialty is and what to look for in your background. Here’s what you can count on if you decide to ask me to develop a professional resume for you. This section is the most important part of your resume. It will immediately grab a reader’s attention and convey your capability through presenting the most exciting factors in your background, followed by a brief discussion of your strengths. This will assure that your resume will not only be read, but in its entirety. It’s a fact that when most people first read a resume, they don’t carefully go through the document word for word. They give it a five-to-ten second initial glance to decide if the applicant’s submission should be considered. Your resume will always pass this test. Your resume will be tailored to target the position you’re seeking while omitting unrelated information. The less you say, the greater the impact of what you do say. To showcase your skill in your field, the focus will be your accomplishments, but your key responsibilities will be discussed as well. I’ll be asking you if you ever made any important changes in your work that improved your performance, the department, or even the organization as a whole. To ensure that nothing has been overlooked, review the almost 220 action verbs listed at the end of this Resume Builder. Consider each one while thinking about your activities at each of your employers. I almost always use the chronological resume format. However, if there’s any factor in your background that could be considered objectionable and eliminate you for the position, I’ll exclude this liability, or, at the very least, minimize it, and then present your experience in the functional resume format. Often, this approach is best for clients who want to change careers or who are returning to the work force after an extended absence. Here, the chronological resume would be a liability. This section is quite straightforward. In addition to college experience, it could include licenses and certifications as well as any further education you plan on getting; workshops, seminars and lectures you attended; your extracurricular activities; and any honors and awards that don’t appear in your summary. Your G.P.A. will be stated if it’s 3.50 or higher. The content will be superb and the statements about your activities will be crisp, impactful, and resonate with readers. Your resume will be organized and laid out so that it’s inviting to read. Clichés won’t be used to describe your strengths. Examples include “charismatic,” “dynamic,” “self-motivated”, “results-oriented,” “people-oriented,” “an out-of-the-box thinker” or that you have a “take-charge personality.” Readers are bored with seeing these descriptors. They also lack originality and are now considered to be fluff. Your wording, grammar, syntax, punctuation, and spelling will be perfect. Underlining and italics won’t be used since some computer scanners aren’t able to read words that appear this way.